Here's a two-piece navy blue long prom dress that is full of fun details. Light- catching crystal clear jewels and tonal beading adorn the racerback sleeveless illusion crop top. The sheer high scoop-neck bodice shows a glimpse of the sweetheart lining for added appeal. Complete with trendy pockets, the full box-pleated skirt, made in beautiful navy blue satin, flows to a formal floor-length. 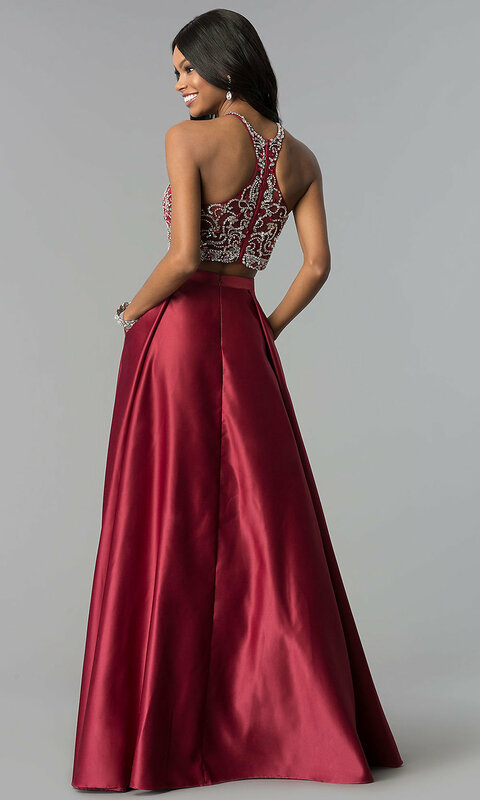 The super cute prom dress is affordably priced and offered in misses and plus sizes. Raise the style bar at prom 2019 when you make your entrance in this navy blue two-piece long prom dress.